Considering that RV stands for recreational vehicle, a considerable part of the reason why people love spending time in a motorhome is to relax and unwind. One of the best ways to do that is by sitting in front of a TV screen. Whether you’re watching a show or a movie, having the right TV monitor in your RV can make a significant difference in how well you spend your time inside the vehicle. So, with that in mind, we wanted to take a look at some of the best TVs you can install inside your rig. What’s crucial to understand is that not all TV monitors are the same. It may seem like such an easy thing to put a new screen inside your mobile home, but you have to consider how well it will travel and how you can mount it. So, when choosing the best TV for RVs, we’ve made sure to narrow our search to a handful of options that are ideal for life on the road. Fortunately, we are living in a golden age of technology, which means that it’s never been easier to find slim, sleek TVs that can provide crystal-clear imaging without weighing a ton. When you consider how cumbersome old CRT monitors used to be, it’s difficult to imagine having one in your rig. That being said, basically any TV you will find today will be a) relatively affordable, and b) HD-quality. However, not all options are alike, which is why we still highly recommend comparing different models to be safe. In this case, we have an LED TV that will be a perfect fit for your mobile home. Let’s see what it can do. Although many modern TVs will claim to have HD-quality imaging, one issue that you can still run into is noise. This problem persists mostly with broadcast signals, so if you plan on watching local channels in your RV, you will have to consider how much noise may come along with it. Thankfully, if you install this TV into your rig, noise shouldn’t be much of a nuisance. The system corrects for it and ensures that your signal is as sharp and clear as possible. That being said, noise can’t be eliminated 100% in some cases, so keep that in mind as well. Another reason why you can rely on this TV for better high-definition images is that it will correct for color imbalances. Although this problem is not as prevalent as it used to be with CRT monitors, it can still occur, which is why I like that this particular model compensates for it. When looking at images on this screen, you will marvel at how bright and colorful it can be. It’s like having a computer monitor on your wall - it’s really gorgeous and will keep you entranced the whole time. Speaking of computer monitors, one nice feature of this TV is that you can hook up your PC and use this screen instead. Whether you have a laptop or a tower, being able to utilize a larger HD-quality monitor is excellent. Not only will it help you see everything clearer, but you can now do things like stream movies or watch video clips online, rather than having to be dependent on a local broadcast station for entertainment. Although this TV is more cost-effective than some other models out there, that doesn’t mean that it lacks quality. I appreciate the fact that it’s easy to set up and that it can work as both a TV and a computer monitor. I also like that you can choose from a variety of sizes. If you have a larger mobile home, you may decide that a bigger screen is justifiable. On the other end, if your RV is smaller and more cramped, you can downgrade if necessary. The listing says that this TV can run on AC or DC. Some sizes may have trouble with the latter. Thus, if you’re only running on the battery inside your RV, you may have difficulty maintaining a signal at times. Otherwise, this TV is excellent. One issue that you will likely run into when trying to buy a TV for your RV is that most of the time, bigger is better. Since almost everyone is looking to put a massive flat-screen monitor in the home, it can be challenging to find something lighter and more compact. Fortunately, this TV from Axess comes in a variety of sizes, including a minute 13 inches. Although this may seem a little too small, it makes up for it by producing high-contrast images and maintaining an ideal aspect ratio. One of the best features of this particular TV is that you can find the perfect size for your mobile home. Whether you’re in a massive Class A rig or a compact camper van, you can install the right TV for your size constraints. On the small end, 13 inches is perfect for when you have extremely limited space. On the other end, you can get a larger 42-inch model so that you can get a better viewing experience. As you can imagine, mounting a smaller monitor is really easy, thanks in part to its super lightweight design. Overall, this TV is made for the RV lifestyle. Further cementing this TV as the perfect accessory for your mobile home is the fact that you can power it from your RV’s 12-volt adapter. Although you don’t have to do this to get it to work, it helps for when you’re in more remote locations and can’t plug into the grid. As with the Sceptre above, this TV helps you save real estate in your RV by combining the monitor with a DVD player. Better yet, this model works more reliably than the Sceptre, meaning that you get the best of both worlds. Even if you don’t use DVDs anymore, this monitor comes with all of the connections you need, including an audio jack so that you can listen via headphones if necessary. Overall, this TV is built for life on the road. Not only can you find a smaller size than most other models out there, but it comes with all kinds of features that make it easier to put this TV into your RV. I like that it can run off of 12-volt power, as well as the fact that you can connect headphones and watch without disturbing your RV guests or campsite neighbors. I also appreciate that this TV is super lightweight and easy to mount. Although most built-in DVD players are not as good as buying a separate device, this one comes about as close as I’ve seen. Because of its compact size, this TV doesn’t do much with volume. I would highly recommend buying a sound bar to maximize its potential (unless you plan on using headphones most of the time). Also, while the DVD player is better than most, it can still have problems from time to time. These days, it seems like so many of our devices are considered “smart.” Part of what makes these machines smarter than usual is that they can connect to the internet, meaning that you can control them remotely via various devices (i.e., Google Home). In this case, we have a smart LED TV from TCL. If you have a wifi router in your RV, then you’ll appreciate being able to connect this TV to it, giving you access to a broader variety of entertainment options than you may have ever realized. Although this TV is “smart” regardless of the devices you use, it’s built for compatibility with Roku. If you’re not familiar with this device, it’s essentially a box that gives you access to thousands of movies and channels so that you can watch pretty much anything. Since this particular TV screen was built for Roku, connecting the two machines is a breeze. That being said, if you have another entertainment device instead, you can still hook them up, although the process may be a little more involved. Although the resolution on this screen is not as high as other options we’ll see on this list (720 instead of 1080), it’s more than sufficient for life on the road. Part of what makes this particular model so useful is that it uses direct-lit LED technology. This setup means that you get sharper imaging built-in and that you don’t have to worry about the images being hard to see. Keeping with the “smart” designation, this TV screen comes with a wide array of different connections. Although you can hook up your computer wirelessly through wifi, it has USB ports so that you can do so more directly instead. Overall, whether you’re using Roku or your PC, you can access tons of entertainment options, making this a TV for virtually everyone. If you’re going to be getting a TV, you might as well get one that is already smarter than average. Being able to hook this screen up to wifi and other devices (i.e., Roku) helps you get more entertainment than average, meaning that you will be getting a lot of use out of this machine. Although technically HD, this screen’s resolution is not quite as sharp as others with a higher pixel count. Speaking of pixels, this particular unit is a little more prone to having dead pixels, meaning that you may encounter dots or lines on the screen over time. Because you’re living life on the road, economy of space is always a primary concern. Thus, if you can bundle different items together, it can help you make the most of your living conditions since you don’t need as much room for various devices. 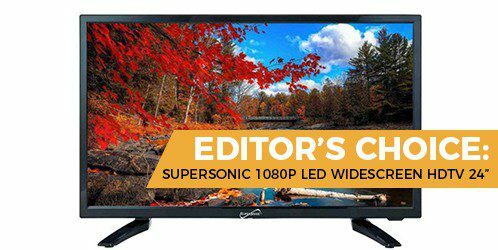 So, with that in mind, this TV from Sceptre can make your life a little more convenient, thanks to its high compatibility with other devices, as well as a built-in DVD player. Let’s see how it compares to the other models on this list. Yes, I know, streaming is the wave of the future. However, if you’re like most people, then you probably have more than a couple of DVDs lying around, waiting to be watched. Although I would prefer for this TV to have a better HD viewing option (i.e., Blu-Ray), a built-in DVD player is better than nothing. The most significant benefit of buying this model is that you don’t have to buy a separate machine to play your DVDs. Even if streaming is mostly your go-to option, it’s nice to have other entertainment choices as well. One of the most crucial aspects of picking out the best TV for your RV is how and where you’re going to install it. Fortunately, this particular model comes with a mounting bracket so that you can make that decision a lot easier. Another benefit of going with a more modern TV is that it’s going to be much more lightweight. When you compare this unit to something from even just 10 years ago, the difference is staggering. To help you put things into perspective, this monitor weighs just six pounds. The average CRT TV was about three to four times that, and even first-generation flat-screen TVs were at least twice that size. If you’re looking for something simple that provides additional viewing and entertainment options, then this TV is an excellent choice. It’s easy to set up and use, and mounting it a breeze, thanks to the bracket provided and the lightweight design. If you plan on watching a lot of DVDs with this TV, then be prepared to run into glitches and bugs. While the built-in player is suitable for viewing on occasion, it can have problems when you use it more often. Thus, you may have to buy a separate DVD player, which defeats the purpose of having this TV. For the most part, picking out a TV is all about sorting through the various features and functions, and then choosing a size that fits your RV. However, for our final option, this TV is only available in 19 inches, so hopefully, that works with your rig. Let’s see what this TV can do. One issue with bringing high-tech electronics onboard your RV is that they are not likely built for life on the road. While mounting the TV to your wall helps stabilize it, your mobile home is going to be jostled around much more than if your screen was stationed at home. Fortunately, this particular model has a rugged metal housing, meaning that it’s much more solid than most of the other TVs we’ve seen. Thankfully, the better construction doesn’t add a ton of weight, so this monitor is still light and easy to move around when mounting. Because you may not always be able to plug into an outlet where you park, it’s nice to know that you can connect this TV to your 12-volt adapter and still get it to work. While this TV isn’t that energy efficient (read: it will drain your battery faster), it’s always good to know that you have options. If 19 inches is too big or too small, you’re out of luck. Also, it doesn’t come with a stand or any mounting hardware, so keep that in mind as well. When shopping for a TV for your home, the entertainment value is more important than anything. How the screen looks and sounds are the name of the game. When it comes to RVs, however, you have to be a lot more discerning. Larger TVs use more energy, and they take up a lot more room. Thus, when comparing and picking out the best model for your rig, you need to keep in mind that some devices are going to be much better than others. Pay attention to energy needs, as well as the weight of the screen itself. Overall, you want to find a model that blends entertainment with on the road practicality. Another primary concern when buying a TV for your mobile home is how you’re going to mount it. While I would highly recommend an adjustable arm that enables you to move the TV around more, you may prefer something more stationary. Many modern TVs come with their own mounting hardware, but they are designed to be placed on drywall in the home. Thus, when picking out a model for your RV, you want to see what mounting options are available before you make a final decision. Another thing to consider is how far the monitor will stick out, both in front and on the sides. If it’s too big and bulky, then it may be far more trouble than it’s worth. There are three ways to watch broadcast television with your new device. First, you can mount a satellite dish to your RV. Second, you can connect to the local cable wherever you are. Finally, you can attach a standard antenna to your rig and hope for the best. The most reliable option is going to be a satellite, but you need to consider its range and whether you’ll have to contact service every time you go outside of your designated service area. Fortunately, several RV-compatible dishes are made for life on the road. Connecting via cable is only useful if you frequent RV stops that have that kind of connection. Also, you run the risk of incurring extra charges as a result. Since all broadcast TV is now HD, using an antenna is an antiquated way of watching your favorite shows. Also, you’re at the mercy of whatever you’re able to pick up, and the signal may get interrupted by various environmental conditions. Although most of these TVs have similar features and benefits, I have to say that the SuperSonic 1080 model is our top pick for your RV. Not only is it easy to set up and use, but it offers some of the best HD images that you can find anywhere.